It's "natural" to forget herbal teas or botanical capsules when your doctor asks you what drugs you may be taking. Nevertheless, prescription blood thinners can be either negated or dangerously amplified by certain herbs. Fortunately for people who turn to peppermint for its ability to sooth digestive complaints, the herb is neither a blood thinner nor a coagulant. Peppermint can, however, affect how blood thinners and other drugs break down in the body, so always ask your doctor to monitor you for signs of negative interactions. Peppermint, the mint most commonly used for medicinal purposes, is not an anticoagulant or antiplatelet substance. Instead, the herb possesses antispasmodic and numbing properties, reports the University of Maryland Medical Center. These qualities make peppermint useful for soothing an upset stomach or easing aches and pains. Peppermint tea is a classic remedy for occasional nausea and gas, but peppermint in enteric capsule form is recommended for irritable bowel syndrome. For headaches and skin irritations, apply a cream or diluted tincture containing peppermint to the affected area. Prescription blood thinners reduce the risk of blood clots, which clog arteries and can lead to heart disease and stroke. The two main types of blood thinners are anticoagulant drugs, such as warfarin, and antiplatelet drugs, including aspirin; each works to prevent the formation of blood clots. Doctors may prescribe some form of blood thinner to people who are overweight or who report irregular heartbeats, or who have already-diagnosed conditions such as congestive heart failure or phlebitis. 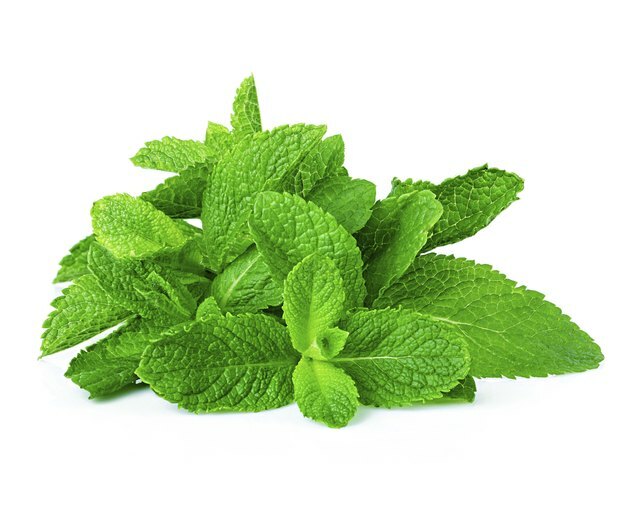 Peppermint falls into the "likely safe" category when used as a culinary herb, and "possibly safe" when taken in concentrated amounts as medicine, according to the National Institutes of Health. Drug interactions, which are largely theoretical, involve peppermint oil's potential to change how drugs break down in the body. For blood thinners, peppermint may slow down how quickly your liver processes the drug, strengthening the medication's effects and side effects including gas and diarrhea. Always ask your doctor about herbs, foods or other medicines that are likely to interfere with your blood thinners. The herbs garlic, ginkgo and ginseng, for example, may be dangerous when taken in combination with prescribed anticoagulant or antiplatelet drugs. Other substances that have negative interactions with blood thinners include foods high in vitamin K, a blood-clotting nutrient helpful for people with bleeding problems, but which can somewhat negate medicines for preventing blood clots. Taking a medication for pain can interfere with or dangerously magnify the effects of prescription blood thinners; calcium supplements, thyroid medications and anti-seizure drugs may also interact negatively with blood thinners.